Full disclosure: I’m leery of space alien movies where the aliens are non-threatening, such as Contact or Close Encounters (when they are hostile, at least you know there will be action). I don’t know anything about the aliens, the genre doesn’t lend itself to backstory, and I have tired of the persistent trope of the dewy-eyed scientist versus the steely militarist. 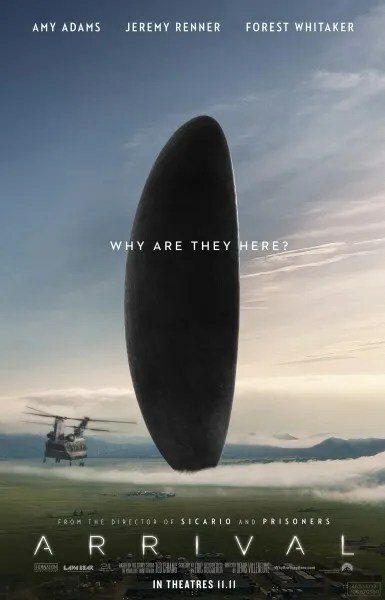 Add to that prejudice my own limitations of imagination and intelligence – space-time continuum fare has the same effect on me as the math part of the SAT (“C, C, C, C, C, C . . . “) – and you have what you need before reading my take on Arrival. It’s not bad. Amy Adams is effective as the grief-stricken linguist brought in to communicate with aliens who hover above the earth, causing worldwide panic, and Jeremy Renner plays her colleague with some verve and the appropriate amount of dew in his eyes. As the stern military liaison, Forest Whitaker surprises us all by under-acting, and the plot is, at times, engrossing. It’s not all good either. It is a dark, dreary film; it gives us the process of communication-through-translation without a shared form of discourse, which is both admirably ambitious and a little boring; and it can be lazy (there is an entirely underdeveloped subplot involving a treasonous act that comes completely out of nowhere; the idea that Sudan and Sierre-Leone have militaries capable of doing much to the aliens is hilarious; and the geopolitical moralizing – “can’t we all just get along?” – silly). I sense, however that this is a smart film, and likely too smart for me.